What’s wrong with young people today? It’s a perennial question, but a certain pattern can be detected in the concerns being aired right now. There’s health and nutrition: Almost a third of Americans under age 19 are now overweight or obese, habituated to a diet of cheap processed food. There’s financial literacy, with debt spiraling up to unsustainable levels as students juggle increasingly complex burdens of credit payments and student loans. And there’s the general issue of self-sufficiency, with record proportions of young adults living with their parents, unable to patch together the means and the will to set up house for themselves. These are symptoms of a rocky economy, of course, but they suggest another diagnosis as well: Many young Americans now lack the domestic savvy that it takes to thrive. The basics of cooking, shopping, and “balancing a checkbook”—once seen as knowledge that any young woman, at least, should have—are now often not learned by young people of either gender, even as we’ve come to understand their major societal implications. And for adults, these skills have receded as well. In the family of 2013, more than 70 percent of children live with two busy working parents or a single parent, which means more takeout, cheap replacement goods instead of the ability to fix or mend, and fewer opportunities to learn essential home skills within the home itself. A domestic science class at the Horace Mann School in Tulsa, Okla., in 1917. Michael Moss, an investigative journalist whose best-selling recent book “Salt, Sugar, Fat” traces how food companies hooked Americans on processed foods, also wants to see a revitalized home economics. In his book, Moss writes that companies including General Foods “infiltrated” home ec classes in the 1950s, turning teachers into veritable saleswomen for convenience foods. Moss sees this as the beginning of the end of a culture that valued home-cooked meals made with “real” ingredients. “The decline of home economics is a huge part of the shift in this country to mindless eating,” he said. Its revival could help undo that damage. Given its potential impact, why isn’t such a revival underway? In part, home ec has become a victim of education trends: School budgets are contracting, many more students are preparing for college, and class hours are increasingly devoted to a narrow core of academic subjects and testing. Home economics also has to conquer its associations with training non-college-bound girls to be good wives. Then there’s the pesky fact that home economics hasn’t technically disappeared: It still exists, rebranded with a clunky and still largely unknown new name, and has expanded its umbrella, in the knowledge it covers, nearly to the breaking point. Still, it wasn’t so long ago that we had a model for setting our young people on the road to self-sufficiency. Could a reimagined home economics teach a new generation of children how to thrive? If any single person could be said to be the founder of home economics, it is the formidable Ellen Swallow Richards, a Bostonian who was the first woman admitted to MIT. She served as the first president of the American Home Economics Association and was instrumental in coming up with the term “home economics,” officially adopted at a conference “for the betterment of the home” in 1899, just in time for the dawn of a scientifically minded century. Though it may now seem impossible, the discipline was originally rooted in progressive and even feminist thinking. The idea was to bring scientific rigor into the home, and to professionalize women’s domestic work, bringing dignity and efficiency to both. Elite colleges like NYU, Penn State, Cornell, and the University of Chicago soon had home economics departments that trained professionals working for corporations and the government, including the federal Bureau of Home Economics, founded in 1923. Those departments also began turning out a steady supply of school teachers, which helped turn home economics into a standard subject in grade schools and high schools around the country. During the Depression, Eleanor Roosevelt urged all girls to take home ec to learn how to run an efficient household; students in nutrition classes were said to be “combat troops” against malnutrition. In 1959, about half of all American high school girls were enrolled in home ec, where they learned how to cook, sew, make a budget, and, crucially, how to shop. Boys were occasionally included—“Boys Take Home Ec, Too!” trend stories have been around since at least 1930—but they were more often shuttled into shop class. 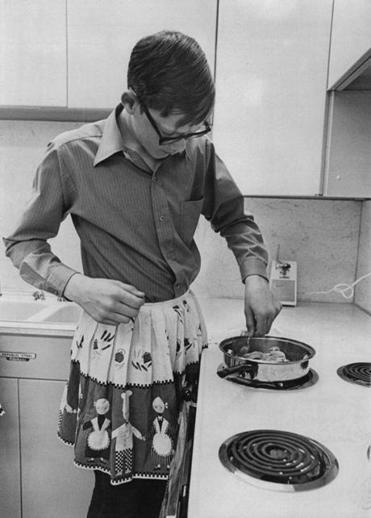 A boy tries out home ec in Denver in 1970.
revolutionary ideas about sanitation and nutrition had become conventional wisdom. 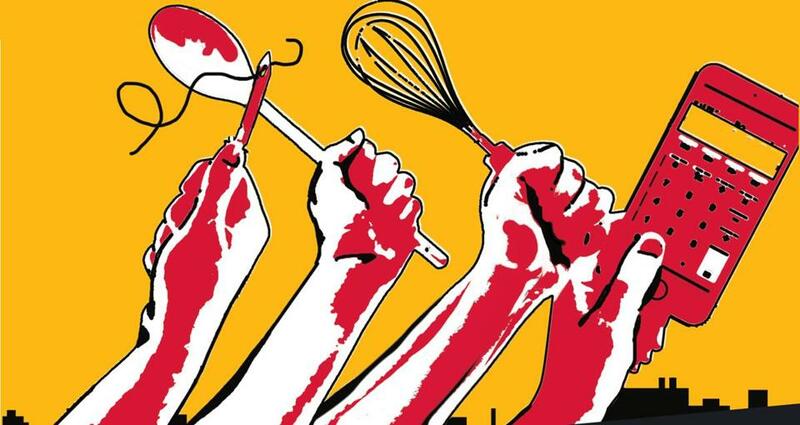 Home economists, including teachers, had also become hopelessly entangled with the interests of food and appliance companies, promoting convenience foods and consumerism in the classroom. And as the women’s movement picked up steam and women moved increasingly into the workplace, the notion of teaching girls to cook and sew while boys hammered on wooden tie racks came to seem not just old-fashioned, but reactionary. When activist Robin Morgan addressed the American Home Economics Association in 1972, she said, “As a radical feminist, I am here addressing the enemy,” and accused home ec classes of producing young women who were “a limp, jibbering mass of jelly waiting for marriage.” She might have been the most colorful critic, but she was far from the only one. With these shifts, a class that had once taught the essentials was now seen as anything but essential itself. Where home ec had once generally been required, classes gradually became optional. Many college-level programs disbanded completely in the 1960s, or changed their names to things like “human ecology” or “human sciences.” The shift took longer to reach middle and high schools, but in 1993, members of the American Home Economics Association (which represents teachers, academics, and professionals) convened at a major conference in Scottsdale, Ariz., and voted to change their name to the American Association of Family and Consumer Sciences. Rebranding didn’t end up changing the discipline’s image much. Though all states still offer Family and Consumer Sciences, or FCS, in some form and in some schools, the numbers are grim. As of a 2006 survey, only three states still required any kind of FCS class in junior high or high school. 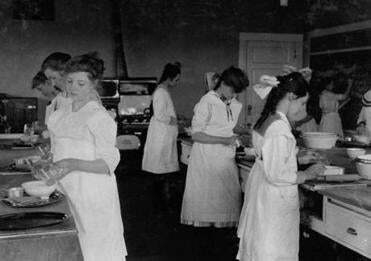 Home ec once lasted a whole year; today, classes are often just nine weeks long. The number of secondary students enrolled in FCS programs has declined by 45 percent in the last decade, to about 3 million students, according to new, still-unpublished research by Carol Werhan, a professor in family and consumer sciences education at Pittsburg State University in Kansas. Part of the problem may be that no one seems to know what FCS is, exactly—or who it’s for. The AAFCS describes its domain as a body of skills and knowledge “that helps people make informed decisions about their well being, relationships, and resources to achieve optimal quality of life.” In practice, it covers an astonishing range of subjects, and increasingly, it means vocational training for high school students interested in careers in hospitality, tourism, social work, food science, child care, fashion design, and other fields. The class is almost always an elective at the high school level, and about two-thirds of students are female. (In middle schools, which are likelier to have all students take the same classes, the breakdown is closer to 50-50.) If home ec prepared women to be good housewives, then FCS now prepares its students for low-paid work in traditionally feminine parts of the service sector. Within the world of “family and consumer sciences,” there are few voices agitating for a dramatic reimagining of what the classroom could look like. (The FCS experts—all women—I interviewed for this story were unfailingly polite, but I’ve never reported a story in which more sources asked to be taken off the record before saying anything even remotely critical.) Instead, the voices speaking up loudest on behalf of a revived, revitalized home ec belong to outsiders. If the community itself is stuck handwringing over branding, it’s hard to escape the conclusion that one of the biggest enemy of home economics may just be home economics. If anything, today’s recession-scarred young people need these lessons more desperately than their grandmothers did. “Home ec when I was [enrolled] was less important societally than it is today,” said Ann Cooper, director of nutrition services for Boulder Valley School District in Colorado and a major voice for school-food reform. She learned how to cook from her grandmother, but many young people today aren’t so lucky. In the ideal, home ec might be more than a shopping and cooking class. Most people may not balance a literal checkbook these days, but basic financial literacy is arguably more important than ever: As pensions disappear, Americans are increasingly responsible for setting up their own retirement plans; credit card offers and student loans are complex decisions with lifelong repercussions. Even sewing is gaining a certain relevance, as consumers grow increasingly wary of disposable garments made in unregulated factories overseas. An ambitious class could also include things like basic household plumbing or car repair. And remember woodworking? In junior high, Lichtenstein ended up in a woodshop class with two other girls after home ec filled up. “That was fabulous,” she said. “It showed me how pivotal a course like that could be.” The skills she learned still come in handy around the house. These are all basic skills, but they’re not being treated as basic by our test-driven education system. The people advocating for a new home ec see promise in the idea of a home ec class for all, targeted at an audience broader than just women, service workers, or students interested in becoming professional chefs. “If it’s required of everyone,” Lichtenstein said, “then there’s a message sent that this is basic, critical knowledge, and not something to fill up the time of kids who are not academically inclined.” For a revitalized home economics to succeed, it will need to teach skills that all of us would want our kids to know.